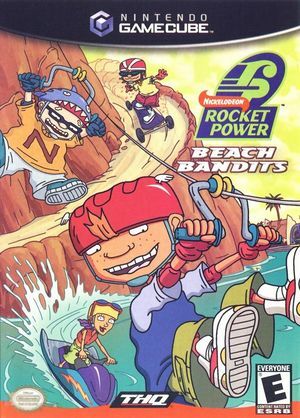 In Rocket Power: Beach Bandits summer is just around the corner, and the kids from Ocean Shores look forward to the Annual Ocean Shores Surf Contest. But as Otto, Reggie, Twister, and Sam finally reach the beach, they make a startling discovery--most of the sand is missing, and the surf contest has been postponed. Now it's up to you to guide the kids through Ocean Shores, The Lakes, The Robot Factory, and Mondo Mountain in the effort to discover who stole the sand. In each area, you'll battle robot minions, use the new wave runner and zip-line glide, and play extreme sports, such as skateboarding and inline skating. When the sun is being rendered to the camera at Ocean Shores for example, this causes extreme slowdown under default settings. Just set Skip EFB Access from CPU to checked to avoid this issue but it will not emulate the sun shine effect. Similar to the Sand Ocean issue of F-Zero GX. For some reason, using a controller that interfaces with the XInput API that Dolphin uses, like an Xbox 360 controller, instead of using a keyboard that uses a different API can slow down the emulation of this game. See issue 8490. The bug is improved but not entirely eliminated probably thanks to 4.0-7538. Whenever the player is using the skateboard in-game, bumping into objects or landing after a jump causes heavy emulating slowdown. The current workaround is disabling controller rumble in the settings. After ascending Mondo Mountain and riding the elevators and rotating platforms to the top, you are confronted with the task of getting a monorail pass. After passing through the door and waiting for the area to load, the camera just blacks out. You can see your health and other UI elements, you can change characters, you can attack with your hockey stick, but the camera is just black. It is unconfirmed whether or not the character is actually moving despite the camera not showing anything in the play area. If so, it might be possible to continue through the level blind, and maybe the camera glitch would clear up in the next area. Otherwise, the rest of the game would be unplayable. The graph below charts the compatibility with Rocket Power: Beach Bandits since Dolphin's 2.0 release, listing revisions only where a compatibility change occurred. This page was last edited on 28 July 2017, at 19:54.